Chiropractic Care at Maplewood Spine and Fitness Center. Maplewood chiropractor, Dr. Greg Eastlund offers over 25 years of chiropractic expertise to his patients and the community. 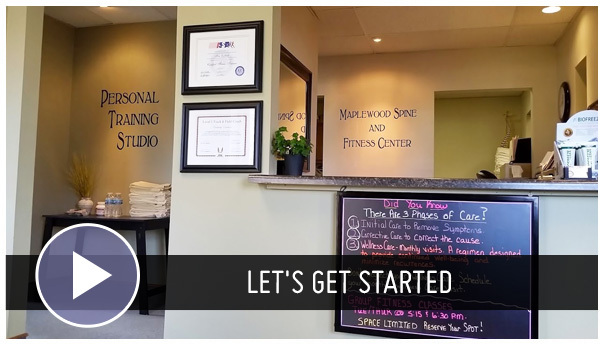 At Maplewood Spine and Fitness Center we offer the very best chiropractic care for automobile injuries, work injuries, back pain, headaches, sciatica, neck pain and many other ailments. Chiropractic can help alleviate pain and improve your overall well-being. The goal of a chiropractic adjustment, also known as spinal manipulation, is to correct structural alignment and improve your body’s nerve function. At our clinic, you will find a chiropractor who understands the most current techniques and approaches to addressing your health problems. You will find this site helpful in learning more about us, the type of care you will receive as well as other ways to improve your health and the quality of your life. How often have you been told that in order to improve your health that you need to lose weight or eat better? Is your weight, nutrition choices and/or pain a contributing factor to your current health status? Our clinic offers a multidisciplinary approach to your health, utilizing the skills and knowledge of not only the Doctor of Chiropractic, but also a Certified Nutrition Specialist, Certified Personal Trainer and a Certified Yoga Instructor. Many of our patient’s utilize all of our services, but it is ultimately up to you to decide which services are right for you. How do you choose a chiropractor? Knowing a doctor’s principles before calling and making your first appointment can reduce any anxiety you may have and offer you reassurance that you will receive quality care. We want you to know our principles, so please take a moment to review them here. Many people are unaware of how chiropractic works. Dr. Eastlund will make sure you understand exactly how chiropractic works to heal your body and relieve pain. Our goal is to educate you about chiropractic and other solutions to common health problems. We will motivate you to take a more active and responsible role in restoring and maintaining your own health as well as inspiring the people around you. have and encourage you to stop in or call today! (651) 779-9282. Very nice staff and atmosphere! This has been my best experience with a chiropractor. I felt the difference from just the first visit. Thank you Dr. Eastlund! I am a patient at MPLWD spine and fitness and get 100% awesome care when needed. I highly recommend their quality service to everyone. Very impressed – office was very nice and staff were very professional and friendly. I have never felt so good after each adjustment! I love the friendly service and the super fun fitness classes. I had a great experience and I will be coming back with my kids. I would recommend Dr. Eastlund to friends and family very good work. I wish I would have come in sooner, I can now walk without pain. These stretches are very important. I was grateful that Dr. Greg took such thorough and detailed notes. It really will help with my Workman Comp. process! You always feel welcome there, even if they are busy they will always fit me in. Awesome place! friendly, attentive and feeling great after each visit! Thank you! My back is feeling much better now! No need for a second appointment! Thanks for seeing me for a same day appointment! Every visit has been great! Thanks! Felt great after first treatment. Resolved my back pain problems.